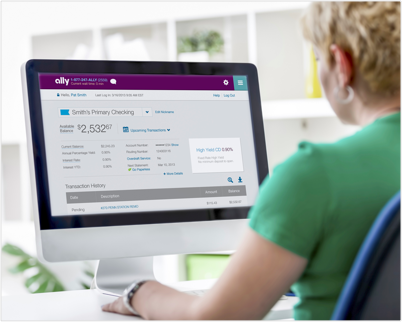 As an entirely online bank, Ally Bank is able to offer its customers some of the best rates in the industry. The company offers plenty of of financial products from credit cards to mortgages, but when it comes to savings, the bank excels at offering a variety of products with attractive interest rates. You can choose from basic savings accounts, certificates of deposit (CDs), money market accounts (MMAs) and more. Of particular interest to retirement savers are the individual retirement account (IRA) options: tradition, Roth and SEP IRAs. Ally Bank works to provide the best experience for the customer, with competitive offerings and highly responsive customer service representatives. So while you may not have a physical location to go to, the bank makes up for it with their constant accessibility. Read on below to explore Ally's many offerings. Free access to any Allpoint® ATM in the U.S. Ally Bank got its start back in 1919 focusing largely on helping auto dealers and those who needed auto loans. Throughout the years, the company has changed with the times, constantly working to improve their services. Today, Ally is an entirely online bank without any physical branches. According to its website, that allows the bank to “offer greater value with consistently competitive rates and convenient around-the-clock support” for customers. Not only does it offer checking accounts and various kinds of savings accounts, but the company also offers auto loans, investing opportunities, credit cards and home loans. This could come in handy if you’re looking to keep all your financial accounts in one place. When it comes to savings accounts, Ally Bank offers a few different options in online savings accounts, money market accounts and certificates of deposit. All of the accounts offer interest rates above the national average. You won’t have to worry about maintenance fees with any account either, making these accounts almost perfect for saving money. Whether you want a traditional savings account, a money market account or a certificate of deposit, Ally has got you covered. It offers all three, all at competitive rates. All three kinds earn interest that’s compounded daily, nor do they require a minimum balance at any time. Some accounts will require a minimum deposit amount, though, so you may want to be on the lookout for those. You may also open either account as a Trust account. No matter which account you have, Ally Bank boasts dedicated 24/7 customer service and guaranteed security whether online or mobile banking. The company is also a member of the Federal Deposit Insurance Corporation (FDIC), meaning your money is FDIC-insured. Minimum Deposit No minimum deposit required to open account and no minimum balance requirement either. Access to Your Savings Account Online, mobile, by phone, check requests or wire transfer. Fees Ally promises no hidden fees. Fees may be charged for the following: returned deposit items, overdraft item paid or returned, excessive transactions, expedited delivery, outgoing domestic wires and account research. The Ally Bank Online Savings Account offers an APY applicable to all balance tiers. No matter how much you deposit or how much is in the account at any given time, the balance will earn 2.20% interest. Interest is compounded daily, meaning your interest will in turn earn interest. Plus, you don’t have to pay any monthly maintenance fees. Ally promises its customers no hidden fees. The only fees that you may be charged are for returned deposit items, overdraft item paid or returned, excessive transactions, expedited delivery, outgoing domestic wires and extensive account research. So not only will your money be earning more money, but you don’t have to spend that on fees to keep the account. Ally makes it easy to deposit, withdraw and manage your Online Savings Account, plus any other Ally accounts you might have. You can move money between your savings account and other Ally accounts or to outside bank accounts as well. You may also schedule transfers up to a year in advance. Managing your savings account can be done over the phone, online or on mobile. To make a deposit into your savings account, you can deposit a check through Ally eCheck Deposit™, online transfers, direct deposit, wire transfers and sending checks in the mail. You cannot make cash deposits, though. To withdraw funds from your savings account, you can do so online, through a wire transfer, a telephone transfer or make a check request. It’s important to note that federal law limits you to six outgoing transactions per statement cycle for savings accounts. You will incur a fee of $10 every time you go over that limit. Minimum Deposit No minimum deposit required, but you can get a higher APY with a larger deposit. Access to Your CD Online, mobile and via phone. Plus, renewal is automatic. Fees No maintenance fees, but there will be penalties for withdrawing from your CD before maturity. The amount of the penalty will depend on the length of your CD term. An alternative to the traditional savings account, a certificate of deposit comes with an expiration date, before which you cannot withdraw any money without facing hefty penalty fees. The first CD offered here is the Ally Bank High Yield CD which offers some great rates. You can choose from a number of term lengths including three, six, nine, 12 and 18 months or three and five years. All term lengths have three different APYs that will apply depending on how much you deposit. You may also open a High Yield CD as an IRA High Yield CD. 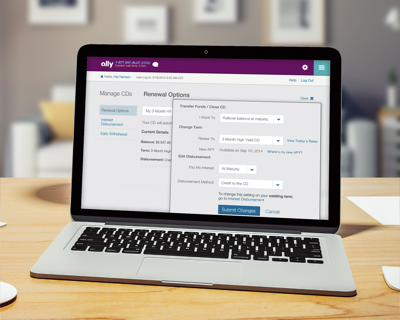 The second type of CD Ally Bank offers is the Raise Your Rate CD. You can choose between a two-year and a four year-term. You may have the chance to increase your rate once within your two-year term and twice within your four-year term. This increase can happen if the bank's rates increase for your specific term and balance tier. This CD is also available as an IRA Raise Your Rate CD. The third kind of CD that Ally Bank offers is the No Penalty CD. This is available only as an 11-month term. Unlike most CDs, the No Penalty CD offers some flexibility when it comes to withdrawing before full maturity of the account. You may withdraw everything from your account after six days have passed since you first funded the account. This won’t incur any penalties. All Ally Bank CDs include interest compounded daily, availability as a trust, automatic renewal at maturity and FDIC insurance. The bank also offers a 10-day best rate guarantee. This guarantees you the best rate available to your term and balance tier if you make a deposit into the account within the first 10 days. Note that you cannot add funds to a CD at any time. You open the CD, put some funds in there and wait until its maturity date. Only then can you add more money into the account. You have a 10-day grace period after the maturity date to transfer or add funds. Luckily, you can schedule a transfer up to one time before that date or during the 10-day grace period. You can transfer your chosen amount to another Ally account, another connected and verified account or through a check. These kinds of transactions and changes can easily be made by logging into your Ally online banking account. There, you can manage your CDs, and other accounts, like account renewal as seen in the above image. Minimum Deposit There is no minimum deposit requirement, nor a minimum balance requirement. Access to Your Money Market Account Online, mobile, by phone, wire transfer, through your debit card and checks. Fees The only fees you may be charged are for the following transactions: Cross border or currency conversion, returned deposit item, overdraft item paid or returned, excessive transactions, expedited delivery, stop payment item, outgoing domestic wires and excessive account research. Ally Bank offers customers another savings option with its Money Market Account. A money market account is like a mix of a checking account and a savings account, earning interest and providing debt card and check writing abilities. Ally Bank’s Money Market Account offers its interest rates based on balance tiers, but still much higher than most other money market accounts. Luckily, the bank doesn’t require a minimum balance in the account while you hold it. That way, you’ll be earning interest, which is compounded daily, without a penalty for not having enough money in the account. Ally Bank also won’t charge any maintenance fees for having the account. You get to keep your earnings and not worry about pesky fees. There will be fees for out-of-the-ordinary transactions, though. This includes cross border/currency conversion, returned deposit item, overdraft item paid or returned, expedited delivery, stop payment item, outgoing domestic wires and excessive account research. To deposit money into your money market account, you will need funds other than cash. The bank can accept deposits through its Ally eCheck Deposit™, online transfers, direct deposit, wire transfers and checks through the mail. Once the bank receives your initial deposit, you can expect to receive your debit card and check order in the mail within 10 business days. Your debit card can be used at the ATM and comes with EMV chip technology. As with a checking account, you can re-order checks once you run out. You can also expect those to arrive in the mail within 10 business days. Again, you will be limited to six outgoing transactions per statement cycle per federal law. Any transaction that goes over six will incur an excessive transaction fee. However, you will have access to unlimited ATM withdrawals and check requests through an Ally Bank money market account. Plus, the bank can reimburse up to $10 per statement cycle on fees spent at other ATMs. Minimum Deposit No minimum deposit or minimum balance required. Access to Your Account 24/7 access online, mobile, by phone, mail, wire transfer, direct deposit or ATM. Fees Ally Bank is straightforward about the fees that may be charged. These fees involve the following transactions: cross border/currency conversion, returned deposit item, overdraft item paid or returned, stop payment item, rush delivery of debit cards or other items, overnight bill pay, same-day bill pay, outgoing domestic wires and excessive account research. Ally Bank is one of many institutions that offer interest-earning checking accounts. The Ally Bank Interest Checking Account offers two different APYs depending on your account balance. Balances of $15,000 or higher carry an APY of 0.60% and balances below $15,000 carry an APY of 0.10%. Other than those amount thresholds, there is no minimum balance requirement. To deposit money into your interest checking account, you have a number of options. You can transfer funds from another bank account, deposit a check with Ally eCheck Deposit, direct deposit, wire transfer or sending a check in the mail. You cannot deposit cash. Since Ally Bank doesn’t have any physical branches, you can access your checking account funds through any Allpoint® ATM in the U.S. Usage of those ATM machines will be free. Should you need to use another U.S. ATM with fees, you can be reimbursed for those ATM fees up to $10 per statement cycle. Ally Bank MasterCard® debit cards are also equipped with EMV chip technology for added security. To send money, you can use Popmoney®, a secure online way to send money to any U.S. bank account. With your interest checking account, you will receive a MasterCard® debit card, standard checks and postage-paid deposit envelopes at no extra charge. You should receive these in the mail within 10 business days after the bank receives your initial deposit. Your debit card will allow you to withdraw money at any Allpoint® ATM in the U.S. for free. Ally Bank can also provide cashier’s checks to you as a customer, which you can request by calling their 24/7 customer service number. Minimum Deposit No minimum deposit required, but a higher deposit can get you a higher APY. Access to Your Account Online and mobile banking. Security All deposits are FDIC-insured up to amounts regulated by law. Fees No maintenance fees. You may incur a penalty fee for withdrawing from your account before its maturity date. Ally Bank also offers individual retirement accounts, or IRAs. An IRA is a retirement account you can fund with pre-tax dollars without the assistance or involvement of an employer. Ally Bank’s IRA options are very similar to its certificates of deposit, just more tailored toward retirement savings. For one, you can open an IRA High Yield CD. Like with the High Yield CD, you can choose a set term ranging from three months to five years. The length of the term you choose will determine the APY your IRA receives. Sometimes the amount of your deposit will also be included in determining your APY, but Ally still promises competitive rates. If you make your deposit within 90 days, the bank will give you the best rate for the term of your account and your balance tier. Again, you can also snag a 10-day best rate guarantee, which provides you with the best rate for your term and balance tier. With a regular CD, this would apply if you funded your CD within 10 days of your open date. With an IRA CD, however, it applies only at the renewal of your IRA CD. The IRA High Yield CD carries many of the same fees as the regular High Yield CD. Many of the terms and rules of the regular CD also apply here, like making one-time deposits and penalties for early withdrawal. Ally Bank’s second IRA offering is the IRA Raise Your Rate CD, similar to the regular Raise Your Rate CD. The IRA version also comes as a two- or four-year term. If you fund your IRA CD within the first 90 days, the bank will give you the best rate for your term and balance tier. You may also have the opportunity to increase that rate once over your two-year term or twice over your 4-year term, if the rates and your balance increase. Interest is compounded daily, and you will only face fees as a penalty for early withdrawal. This, along with regulations surrounding deposits and withdrawals are the same as the regular Raise Your Rate CD. Finally, you can look into the Ally Bank IRA Online Savings Account. Since it’s not a CD, there are no set time limits for this IRA. However, you are still limited to six outgoing transfers per statement cycle due to federal law. You’ll face penalty fees if you exceed this limit. Luckily, Ally Bank won’t charge any fees for the maintenance of the account. They also promise zero hidden fees. The fees that you might see will be triggered by the following transactions: returned deposit item, overdraft item paid or returned, excessive transactions, expedited delivery, outgoing domestic wires and excessive account research. To make a withdrawal from your IRA Online Savings Account, you need to request a distribution from Ally Bank. This is done either online, on the mobile app or by calling the bank’s customer service line. You may also find the distribution form online, print it and mail it in. All three IRA options offer flexible funding options, including Roth and traditional IRA rollovers. Each type is also available as a Roth, SEP or traditional IRA. Plus, your deposits are FDIC-insured up to the legal amount. This comes in handy since your accounts will be growing at a solid rate with interest compounded daily. Creating a strong savings environment surrounding your retirement plans usually takes more than simply opening an IRA. Financial advisors can help you branch out and dig into the world of investing and other long-term savings methods. The SmartAsset financial advisor matching tool can pair you with up to three advisors in your area that are equipped to handle your savings needs. If you’re ready to be matched with local advisors that will help you achieve your financial goals, get started now. Where Can I Find Ally Bank? Ally Bank is an entirely online institution. So you can find them by simply going online to its website www.ally.com. You can easily reach a representative either by phone or through an online chat system. You can even see an estimated wait time on the website. The company's banking customer services are available 24/7, as are its credit card services. What Can You Do Online With Ally Bank? You can do everything you need online with Ally Bank. You can find out about its various financial offerings, from checking accounts to auto loans to investing to savings accounts. You can open various accounts online and once you have an account, you can easily access it there. If you have more than one account, that’s easily accessible to you, as well. If you ever have any questions, there is always an FAQ section, a search function and contact information. Ally Bank also offers a mobile app to its customers. Showcased by the accompanying image, the mobile app allows you to see your total earnings, broken down by each account. Then you can click on whichever account you're interested in to manage it just as you would online. You can make payments, deposit money, transfer funds or simply check on your balance. 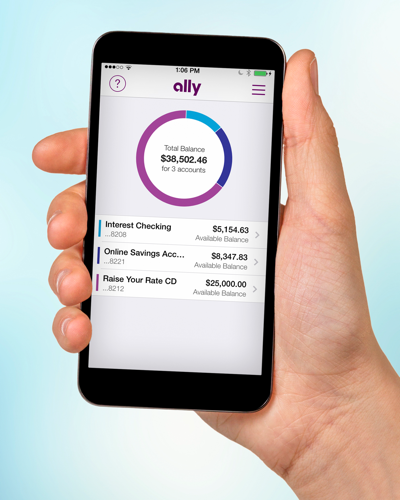 Ally Bank makes it incredibly easy to access your money, no matter which account you have. You can make deposits, withdrawals and transfers with general ease. You can log into your online account on the bank’s website to manage any and all of your accounts. You can do the same thing on your smartphone with the bank's mobile app. There, you can even deposit checks with Ally Bank eCheck Deposit™. You can also call customer service to manage your account. The number of times you can make a deposit into your account will depend on the account type, whether a traditional savings account, a money market account or a CD. All account types will accept any form of payment, except cash. Withdrawals and outgoing transfers are another matter, however. Per federal laws, you will be limited to six outgoing transactions per statement cycle. To make a wire transfer, you will have to make a request online using the online wire transfer form. There will be a $20 fee for sending a domestic wire transfer. You can also print out a domestic wire transfer form from the website and fax it to the number given on the website. Luckily, you have easy access to Ally Bank representatives. So if you ever have any questions or are unsure how to best access your account, you can give them a call. How Can I Save More Money With an Ally Bank Account? Ally Bank is one of the few places you can get such high-earning interest rates. You might expect big banks like Chase and Bank of America to offer the best rates for savings accounts. However, they offer only 0.01% return on their savings accounts, not even coming close to Ally Bank’s offerings. By switching to an Ally Bank savings account, you can earn more money without really having to do much more. You earn more and pay less, especially in fees. Let’s say you deposit $5,000 into an account with a 0.01% APY. After a year, you earn a mere 50 cents. If you were to deposit $5,000 into an Ally Bank savings account with the APY of 2.20%, you earn $100 after a year. If you were to consistently put more money into your Ally Bank account, your earnings would be even more than that. What’s the Process for Opening an Account With Ally Bank? Since there are no physical Ally Bank branches, you will need to open an account either online or by calling its customer service phone number. You may also apply by mailing in the necessary forms, but that requires printing out from the website, so you might as well just apply online. Online, it’s as simple as finding the account you would like to open and clicking the button that reads “Open Account.” You will need to provide information like your Social Security number, your US mailing address and your age. You need to be at least 18 years old to open an account. If you want to open an account as a joint account or as a Trust, you can state that during your application. A huge part of Ally Bank is that it is entirely online, without any physical branches. This can be a big plus to many, but equally a pain for others. Sometimes you just need to talk to a person face-to-face and sign papers in real time. So if you really value those aspects of a bank and don't want to bank with an online interface like in this example, banking with Ally Bank might get frustrating for you. There’s no real further drawbacks unique to Ally Bank that other banks or savings accounts won’t have. For one, it might be a damper that you are limited to six outgoing transactions per statement cycle when talking about various savings accounts. When looking at CDs specifically, it could cramp your style that you can’t withdraw before its maturity date, lest you incur a nice fee. Further, the APY on your savings account could change at any point, perhaps even without prior notice. Ally Bank is overall a very solid option for people looking for a savings account. Not only does it offer traditional savings accounts, money market accounts and CDs, but its offerings carry some of the highest APYs. Compared to the competition, the bank provides a great opportunity for anyone looking to grow their money. Without physical locations, Ally Bank works to offer easy access to customer service and your own accounts. It is also able to boast some of the highest earning rates in the industry and no hidden fees. Its savings accounts don’t charge maintenance fees nor do they require a minimum deposit or balance. It’s a great opportunity to earn more and spend less.